#Cannes near, Villa EDEN ROC Luxe, Pool Sauna Jacuzi Garden, Evenementiel. Villa Eden Roc Provencal style (300m2) on a plot of 3200 m2, situated in the outskirts of Cannes, Cote d'Azur, in a green and quiet 1/4 hours from the beach, with swimming pool (heated if * required) and large solarium, summer kitchen with barbecue and Mediterranean garden, parking. This spacious and comfortable property sleeps up to 11 people with 4 bedrooms + an extra bedroom, 3 full bathrooms including a master suite with sauna and jacuzzi, 2 separate toilets, kitchen with professional appliances, laundry, cloakroom guests and games room with TV. Stay open largely by huge bay windows, dining room with lounge area, bar and fireplace very comfortable with a very large flat screen TV, satellite and DVD, WiFi internet connection. The dining area opens onto the large terrace where you can relax or dine beneath a gazebo with panoramic sea views and countryside. Near the new aquatic complex welfare Nautipolis. http://www.nautipolis.fr/ Given the vast spaces of possibility * receptions. (* With additional heated pool and receptions). 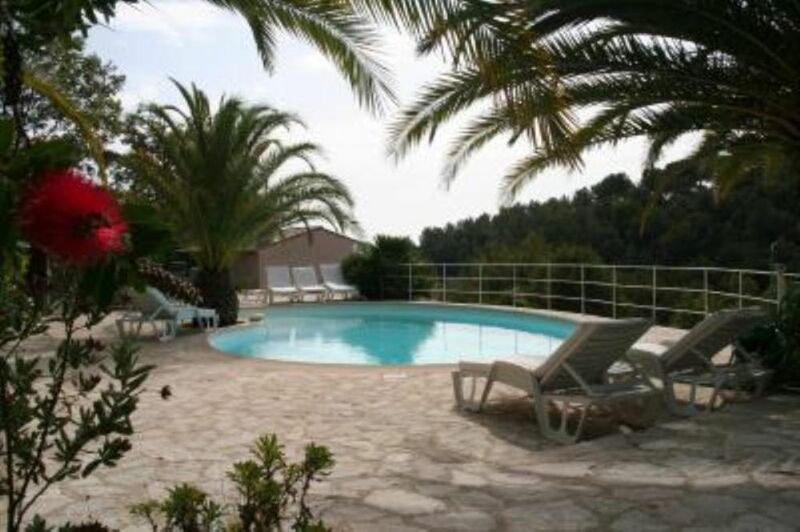 Villa soothing and closed on hill no close neighbors, a quarter of an hour of Cannes, dominant and panoramic sea views to the south and to the north the forest and mountains. Ideal for relaxing or event. Possible extra sound in rental for festive evening. Easily accessible from the airport and Cannes and its festival and congress. Points of interest in the region quickly accessible from the villa ..
Une chambre n''est pas du tout fonctionnelle, sous le toit et minuscule, même pas pour un enfant, mais la vue est imprenable, il y règne beaucoup de calme et de sérénité." "Tres belle maison. Vacances parfaite. trés bonne accueil et bonne disponibilité du propriètaire." Take the highway exit towards Valbonne in Cannes, continue straight to Roquefort les Pins, at the roundabout fountain turn right (Notre Dame) and continue straight until the traffic lights turn left pass pharmacy and stone bridge turn right and then immediately left and continue up to No. 540 and go up the path to the highest. (Text automatically translated) Casino Cannes and Nice. Marineland aquatic park in Antibes. Villages of Saint Paul de Vence (Maeght Foundation), Gourdon, Saint-Tropez. Nice, Monaco and San Remo (Italy).